Is your business based on a well-functioning vehicle fleet and you think of the integration of e-mobility? But you are dealing with difficulties like the inter-day variability of tour-lengths, problems to integrate EVs into existing fleets and working forces, and missing own and reported experiences? The EUFAL platform of exchange, which a consortium of 7 partners from 5 different countries is developing, will be the first user-friendly web-based open source platform of knowledge exchange providing all available data centrally. It will support a more accurate and cost-efficient implementation of EV in commercial vehicle fleets in Europe by offering access to planning tools for optimal fleet composition, planning urban micro-hub solutions, a long-lasting experts network for further consultancy and other. The platform of exchange, policy support documents and the gained scientific knowledge will provide proven tools for companies and policy at different stages of EV implementation: the early planning of EV use, the implementation of EV use, and finally the optimisation of the EV implementation. developing and implementing a web-based information and knowledge exchange platform which integrates all collected and developed decision support tools for EV implementation in companies. supporting companies with information for EV implementations. demonstrating the use of the platform of exchange, and the integrated tools provided, by selected EV implementations in all participating countries. demonstrating commercial EV fleets at different levels of development. 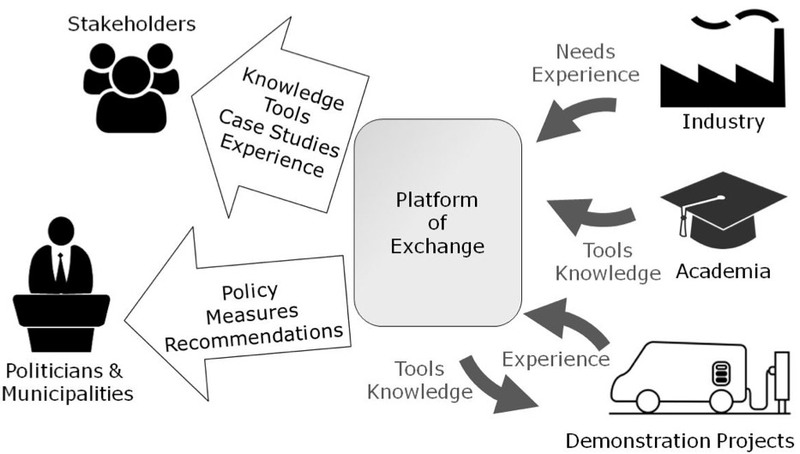 assessing and evaluating the developed platform of exchange, and the integrated tools, to ensure useful project results beyond the project. considering user feedback and expert knowledge in all project developments to guarantee successful EV implementations in commercial vehicle fleets. The project EUFAL (Electric urban freight and logistics) is co-funded by the ERA-NET Cofund Electric Mobility Europe (EMEurope) and national funding organizations. EMEurope is co-funded by the European Commission within the research and innovation framework programme Horizon 2020 (Project No. 723977).